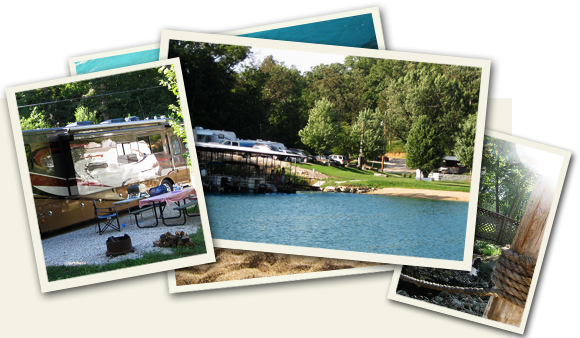 Shorewood Landing waterfront RV Park is located at the end of a no wake cove at the 3-mile marker on the Lake of the Ozarks by the City of Lake Ozark. (We are about 3 miles by land or water to the City of Lake Ozark). There are two gas docks, a large marina, and a bar/restaurant right in our cove. All RV sites are full hookup, gravel, back-in sites with basic cable and WI-FI internet included in the price. We have cabin rental and covered or uncovered boat docks for rent. From Shorewood Landing you are close to world-class golf courses, go-carts, shopping and restaurants on or off the water. The RV Park is surrounded by beautiful Ozark woodlands which can make for a peaceful nights rest. Please pay us a visit on your next trip to the lake. We look forward to seeing you! Call 573.473.5659 or click here to email.